A relocated cross that we thought was lost during renovations work, turned up in a store. 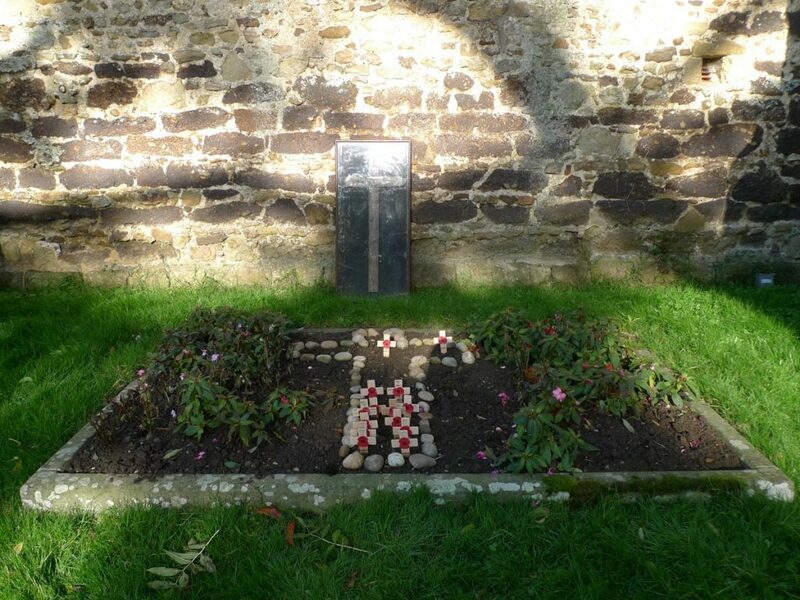 I had no luck locating this cross despite an initial search of the church, churchyard and local cemetery. At the recent heritage open day, I asked the Rector about it who put me onto one of the members of the congregation. He could remember the cross, but didn’t know where it was now. I then asked if a request for information could go into the church notices to see if any other member of the congregation had any information. After a couple of weeks, I heard that it had been found in a storage shed. A few years ago there was major reconstruction done to the tower of the church, which is where the cross had been hung. For its protection it was taken down and stored safely out of harms way. 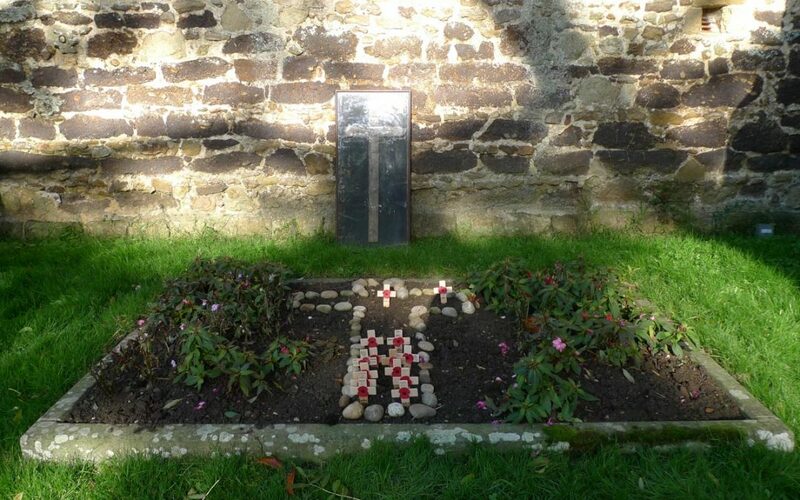 It is a standard GRU cross for an unknown British soldier. To me, just as important as a named one as it represents ‘everyman’. The only information currently known is that it was believed to have come from the Toc H organisation, possibly from a branch in Godalming. 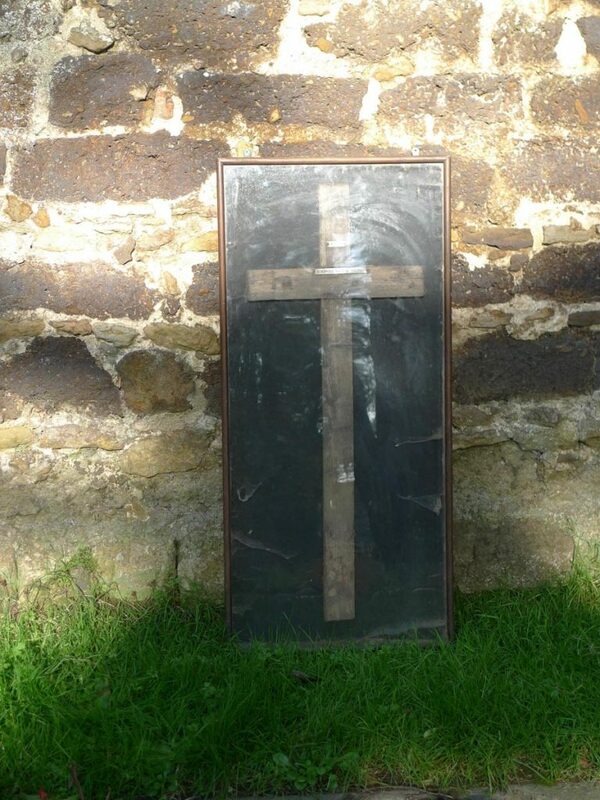 It is housed in a wooden frame with a glass front, but is full of dust and cobwebs. 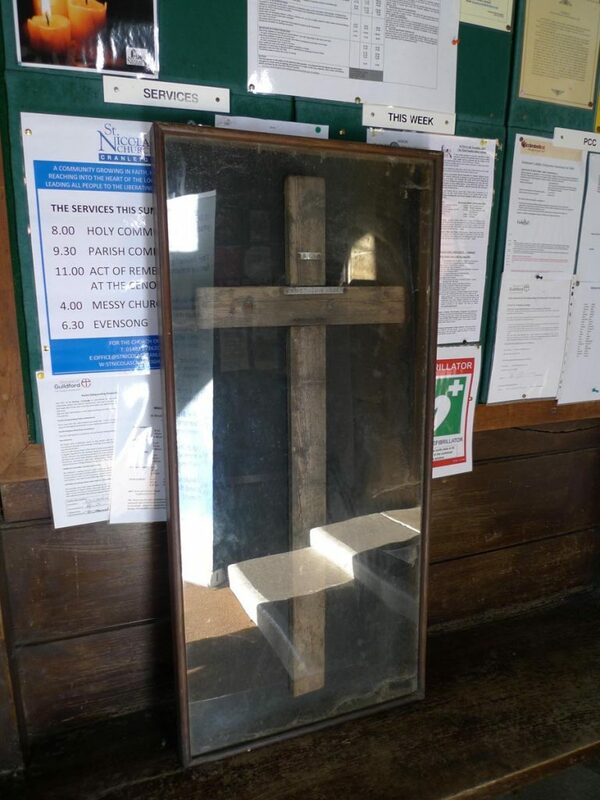 The current plan is to remove it from the case, and clean the glass and backing (although not, it is to be hoped, the cross itself) then remount it in time for the November 2018 centenary of the Armistice. I hope to be able to complete this survey at the time it is re-framed. Unfortunately the sunshine and glass front prevented me taking any good, clear photos. The cross ha been removed from store and is at present kept below the main altar in the church. No work of renovation has yet been done, but it is still hoped to do something about it in time for the anniversary on 11 November 1918. It is to be recorded and photographed by the Arts Society (formerly NADFAS) team who are currently recording the interior of the church. Please note that despite what is printed on OS Maps the dedication of the church is now (and has been for many years) to “St Nicolas”. I am the Secretary of Cranleigh and District Branch of the Royal British Legion. Since February of this year we have been meeting with the Rector with regards planning for the Centenary of the end of the Great War. Part of the plans were to have the marker restored for the Centenary. I approached the Rector a couple of weeks ago about taking it to a local Parish Council event and then having the case restored. He came back to me to say that the marker has gone missing from under the altar, and he has no idea of its whereabouts. Before we report it as being stolen, I was wondering if you knew what has happened to it. Many thanks.